Heartbreaking and funny about nine year old (or so) Oscar, a precocious Upper East Side boy trying to find a secret of his father (who died in the 9/11 attack), interwoven with the history of his grandfather and grandmother, who survived the Dresden bombings. Inventive and funny – I don’t normally like books that try to be creative with typography and pictures to tell a story, but it works here. And Oscar is a hoot, vaguely related to the protagonist in The curious incident with the dog in nighttime, with his idiosyncratic messages "José!" and convoluted, yet strangely logical thinking. My favorite sentence: "More people are live today than ever lived. That means that if they all wanted to play Hamlet at once, there wouldn’t be enough skulls." This entry was posted in Reading on May 24, 2010 by Espen. Norwegian Constitution day today, an integral part of the annual productivity-dampening festival known as May. 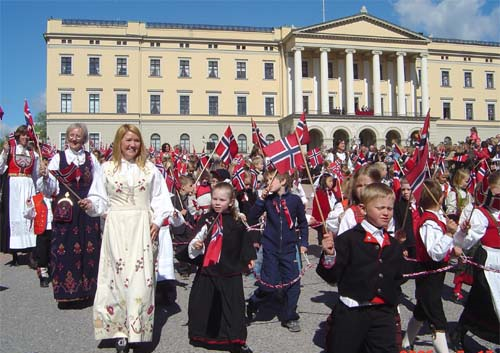 If you want to blend in with the natives, expect to wear your suit all day (including at 0800 flag hoisting at local school), eat ice cream and hot dogs (sold by brass-band parents, see below), and display a Norwegian flag prominently somewhere on your person. You will see brass bands of varying quality, women (and not a few men) wearing folk costumes, even more children carrying flags (upright in the morning, dragging along the pavement after lunch), and, should you go into Oslo or any medium-sized town, an increasing number of drunks (some of them still in folkloristic garb) towards dusk. Suffice is to say that "May 18" and "hangover" are synonyms in Norwegian, whether it is for the usual reason, or for lack of sleep and overexposure to plastic trumpets and sour, underage marching bands. One excellent aspect, though: The almost complete absence of militaristic chest-beating – partly for tradition, partly for lack of chest. May 17th is a children’s celebration, by and large. This entry was posted in Notes from a small country on May 17, 2010 by Espen. These videos have been updated: You find the new ones here. 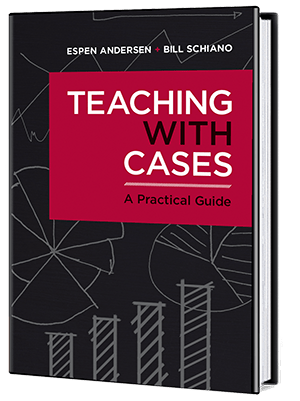 This entry was posted in Academically speaking, Case teaching, Teaching on May 1, 2010 by Espen.